Vine-ripened tomatoes and fresh basil are my absolute favorite pizza toppings. I slice the tomatoes thinly, tear the basil and marry them under a blanket of fresh mozzarella. A drizzle of olive oil and…heaven. However, this deluxe pizza margherita is a summer-only treat, as local fresh tomatoes are but a memory of last August and – aww snap! – my basil plant got hit with frost months ago. Now, tomatoes are tasteless rocks, a single bell pepper costs upwards of $3, and zucchinis are shriveled and soft. Not at all ideal garnish for my Friday night pizza. So what is one to do during the winter months when the pizza cravings hit? I don’t love loading up pizza with meat – I prefer my ham glazed with a side of scalloped potatoes, thank you very much – and gravitate toward vegetarian toppings, no matter the season. Here are some of my favorites, plus my secret weapon recipe to great tasting pizza anytime. Yes, homemade pizza is synonymous with summer, with its luscious tomatoes and colorful peppers, but winter pizzas can be just as scrumptious as their summer counterparts – and even more creative. 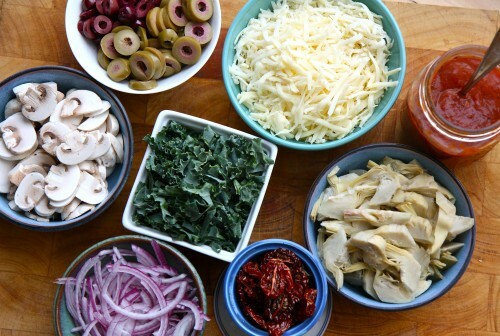 Pictured at top of the post: Kale, Artichoke, Mushroom and Sundried Tomato Pizza. Pesto. I still have frozen pesto from my summer batch cooking efforts. Yep, I’m pretty happy about that. Almost as good as fresh torn basil on my pizza. Onion, Garlic, & Leeks. Sliced or diced, raw or sautéed, do not underestimate what onions and their relatives can add to pizza. Fruits. Green apple & cheddar cheese work in a panini, so why not on a pizza? Figs and pineapple are also excellent choices, though not quite ‘local’ fare for most of us. Mushrooms. Sure we usually slice up the common cultivated white mushroom, but there’s no need to stop there; almost any sort of mushrooms work for pizza. My sister-in-law, Laura, makes a killer ‘white pizza’ that I try to reproduce every once in a while. There’s something about it that is so satisfying, like a bowl of creamy Penne Alfredo, but in pizza form. It must have shrimp, and roasted garlic is a sure way to gain fans fast. My version (pictured above) contains a soft, crumbly cheese (I use Boursin Garlic Herbs ), sliced button mushrooms, small shrimp, mozzarella cheese and thinly sliced red onion. Shrimp on pizza? Yes, please. While I’m satisfied with vegetables and mushrooms, Danny appreciates something more substantial in his pizza. 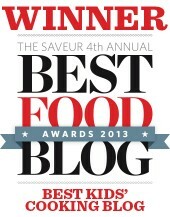 Grilled chicken, seafood, bacon, sausage, and cured Italian meats are all favorites. When we were dating, Danny used to call pizza crust “the handles” and left the gnawed edges conspicuously on the side of his plate, only to toss them later. I objected. I made him dough from scratch. These recipes won him over. Don’t limit cheese to just mozzarella. Try crumbled feta, provolone, or something with a bit more bite like blue or asiago. 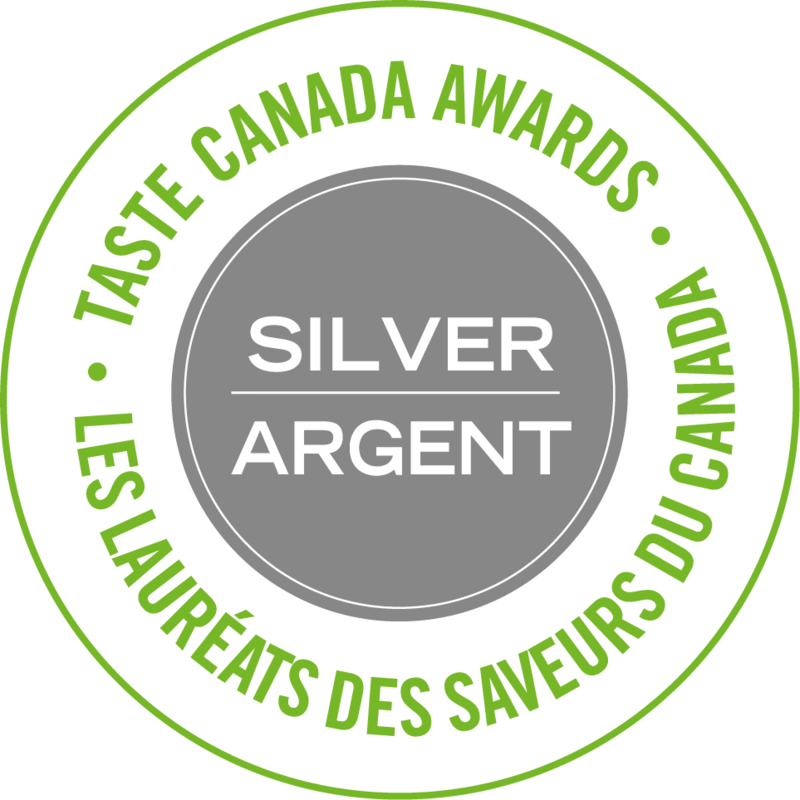 Remember back in July when we talked about canning homemade pizza sauce? Boy, am I ever glad we covered that topic. 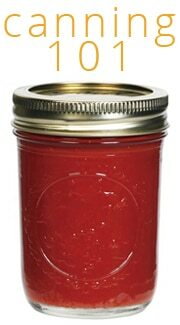 My jars of Roasted Tomato and Garlic Pizza Sauce have been gracing our pizzas all year long. Of course, a simple can of tomato paste also works. If that is all you have on hand, then spread it very thin and add a drizzle of olive oil over the bottom of the pizza. Let’s hear it; what do you top your pizza with in February? 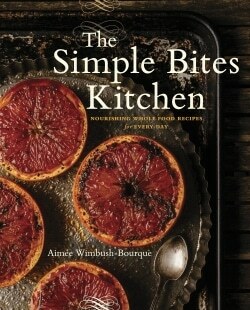 This looks so wonderful- I die for caramelized onions! We make homemade pizza every Friday night. Last week ours was topped with olive oil, roasted garlic, mushrooms, thinly sliced potatoes and goat cheese. Delish! We have pizza once a week, too. My husband’s favorite toppings are shrimp and mushrooms. I like pesto on mine. LOVE all of your suggestions. I’m going to try kale–it’s so nutritious, but I’ve never had it on pizza. As always, you explain the options so clearly. Thanks! BTW, I’m linking to this in my post today. The kale is so surprising because it is so GOOD! I like spinach, but it tends to almost disappear on pizza. The kale holds up well and makes for a substantial topping. One of my favorite pizzas is a caramelized onion, spinach, and bacon pizza with a white sauce from Cooking Light. Wait, bacon AND onions? Amazing. I like to use sun-dried tomatoes and pesto a lot, as in combination with goat cheese to top my wintertime pizzas. I’ve been meaning to try using squash and mushrooms too. My husband and I just made pizza topped with ranch, grilled chicken, cashews and cheese. Our favorite! How original! I bet this pizza variation is just great. Thanks for sharing! I have never thought of pizza in terms of seasons… but adore the concept!! Beautiful job! Ham and canned pineapple bits, or some sausage/pepperoni and onion. I love caramelized onions, so I might just have to try it for my next batch of pizza (along with your honey dough)! I love love love veggie pizzas. Mushrooms, onions, pepper, olives….my favorite. I prefer a light tomato sauce (not a big sauce person) or even a white sauce. I’ve worked for several pizza chains in my time, and I always wished they could put caramelized onions on the menu. My favorite pizza in the world is from California Pizza Kitchen, where they do a shrimp scampi pizza with baby pink shrimp, caramelized onions, and garlic. It is TO DIE FOR. You’ve got some great ideas here too. So you’re the expert! OK, this pizza described sounds TOO GOOD. Do they deliver? To Canada? We finally got our pizza method down – Honey Pizza Dough, Pizza Stone, parchment paper. Only to put Friday pizza night on hiatus while the kids are in swim lessons (= take-out), but I love that bacon and onion idea mentioned above! Him (joyfully) : so we can do pizza again! Me (mistified): with the homemade sauce in our freezer. 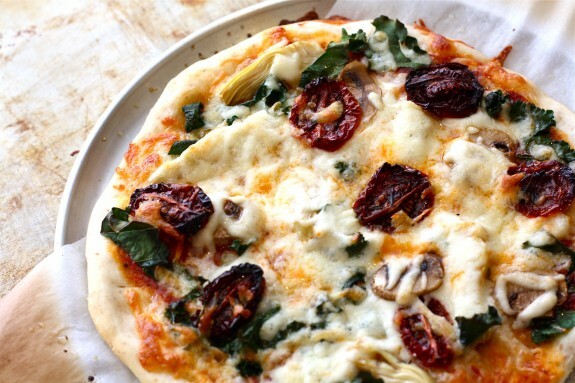 Thanks for sharing this incredible inspiration for pizza! 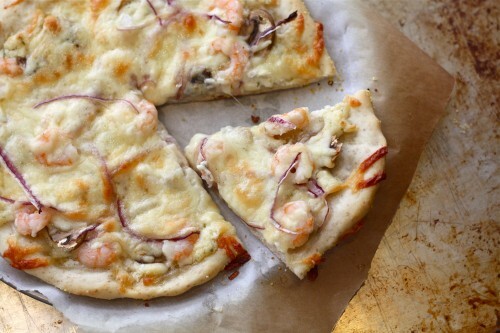 I’m drooling over the first photo, but I do love caramelized onions on pizza. I hope I get a chance to make one of these this week! Love these winter topping ideas! Kale on pizza? What an amazing idea and so inspiring. Love it! Yum! I love loading a bunch of vegetables onto pizza! It’s one of the only ways I can get my daughter to eat them! Love the olives and artichoke hearts! Dumb tech tip: if you break the lock on your oven, you can use the auto-clean feature to run the oven at 1000°, letting you bake a pizza in about a minute. Fun! I like that idea! The “realest” brick ovens bake at 900 for 2 minutes or so. I’d just have to be willing to sacrifice the oven’s warranty probably. I have been looking for a new pizza dough recipe. Both sound yummy. Have you ever used a bread machine to make the dough? 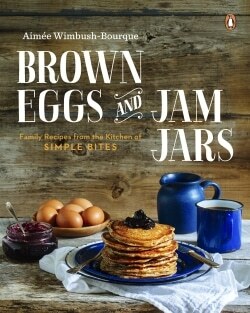 Do you think these recipes would work in a bread machine? 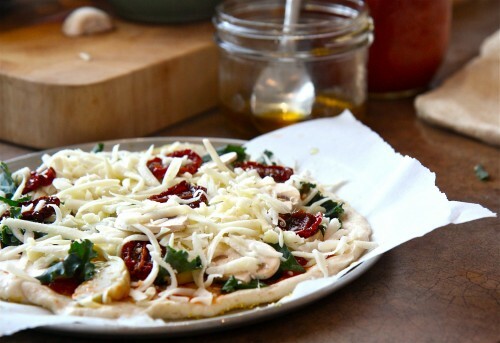 Great ideas for winter pizza toppings! Spring is just around the corner… whoo hoo! I like to add sundried tomato paste to the onions and use that as the sauce on the pizza. My friend got me started on shrimp and pesto pizza-really good with homemade or storebought pesto. One of our favorites is pizza with shredded chicken and spicy peanut sauce, mmm, mmm good. Kim, I have a good bread machine dough recipe (whole wheat) on my blog. I make a batch and use one, freeze the rest (makes 4 total). I am in love with this pizza. 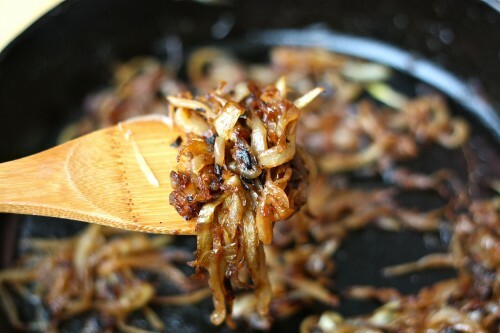 Any recipe with caramelized onions gets a high vote from me. Yum! We like a “hobbit pizza” – sauteed bacon & mushrooms, spinach and feta as toppings on a regular base of tomato sauce and mozzarella. I really like your blog. Let me know if you would be interested in trying and reviewing one of our pizzas or trading links. Hi, you made me want to try to do a batch of onions for future pizzas – do you think I can freeze them? How do i avoid it all clumping up together? Thx! like artisan, premade, and frozen pizzas. 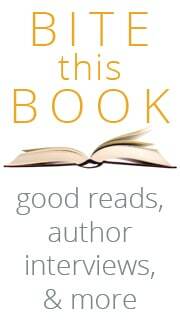 This information incorporates material that may be created like an ad. right temperatures for perfect pizza. time than ever right before. crust and afterwards wrap within a double layer of plastic and foil to guard the pizza from drying during the freezer. nice transform from the standard crust. An additional Thermador special. Preheat your oven in about seven minutes. No a lot more having to wait 1 / 4 of one hour to get going. 5. Grease up a bowl with some olive oil and put the dough inside. Switch the dough about so the top is a little bit oiled. Do you employ dry yeast, fast yeast or contemporary yeast? It can be time to make your back again patio your go-to outside Area. you are able to really ensure it is your own personal. our new oven 🙂 WOW This is often brilliant ideal prime heat to stone warmth ! Walnuts are my very favorite pizza topping. Especially atop rich cheeses and alongside sweet onions and roasted red bell pepper.